The Gloucester club was approaching its Diamond Jubilee when Donald Crichton-Miller took the field for Scotland against Wales in Cardiff in February, 1931. He became the fifteenth player to be capped for his country while playing for Gloucester, but the first for a country other than England. Although he only played 27 games for the club between 1929 and 1931, the dynamic flank forward became a firm Kingsholm favourite and featured in some outstanding displays by his side. Crichton-Miller was born in 1906, in San Remo, Italy where his father, the eminent psychiatrist Hugh Crichton-Miller, had a practice. Hugh Crichton-Miller went on to develop a treatment for shell shock victims while serving as a lieutenant-colonel in the 1914-18 war and in 1920 founded the Tavistock Clinic. Donald attended Fettes College, Edinburgh from the age of thirteen and eventually became head of school and a leading member of the first XV. He went up to Pembroke College Cambridge in 1925 but played for London Scottish after the Varsity match, having failed to break into the university side. Competition for places was fierce and, although he played a number of 1st XV games for the university against leading club sides, it was not until 1928 that he won his only blue following an outstanding performance in a 20-3 Cambridge win over Leicester. He played so well in the Varsity Match, which Cambridge won 14-10, that he was selected to play for Scotland versus The Rest in the final trial at Murrayfield. Scotland won 27-3, but he missed out on selection for the Home Internationals. His second season with Gloucester was the climax of his rugby career. A good start to the club season drew the attention of the Scotland selectors and he was again chosen to play in the trials. A fine performance for Scotland against The Rest in the final Scottish trial at Hawick in which The Rest held Scotland to an 11-11 draw ensured his selection against Wales in Cardiff. He scored both Scotland’s tries in that game and was selected to play in all four internationals, although eventually missing the French game through injury. He also went on a second Barbarians Easter tour. Crichton-Miller left Monmouth High School in 1931 to take up a post at Bryanston School in Dorset. He joined the Bath club and represented Hampshire in the County Championship. 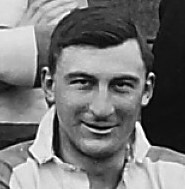 As a Bath and Hampshire player he played for London Counties against South Africa at Twickenham in October 1931 and went on a third South Wales Easter tour with the Barbarians later that season. He played against his old club at both Bath and Kingsholm and was on the losing side for Hampshire against Gloucestershire in the semi-final of the County Championship in 1934. He gained a further Scottish trial in 1932 but never again hit the heights that he had reached while at Kingsholm. He retired from senior rugby at the end of the 1933-34 season on taking up an appointment at Stowe School. Donald Crichton-Miller went on to become headmaster of Taunton, Fettes and Stowe public schools and while headmaster continued to coach successive generations of schoolboys. He died, aged 90, in 1997.